Welcome to the Dragon Story FAQ/Guide, we hope to help you newly deemed Dragon Caretakers to understand this game and get started in an easy going and simple guide. Dragon Story is available in the App Store for iOS devices for free. You can breed, hatch, and raise magical dragons and evolve them into their full potential. The game is associated with Storm8; if you already have an account then sign in, if not simply register and you’ll be able to enjoy the company of other Storm8 members and gift each other map pieces and gold for items, decor, and more! Push Notifications- You can agree to let the game send you notifications and it’ll alert you when your crops are ready for harvesting, eggs are ready to hatch, silver is ready to collect from habitats and much more. Main Menu- To reach your main menu, touch the scroll icon placed directly at the bottom left corner of your screen, from there you’ll be able to see your News Feed, Social Status, and Island Overview. 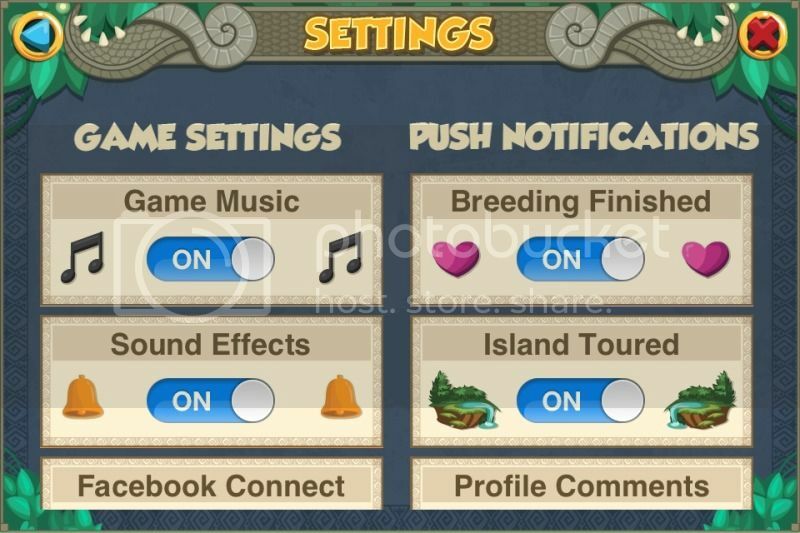 Settings can also be found in this screen with a camera to photograph your island and dragons including a Help/FAQ much like this one. 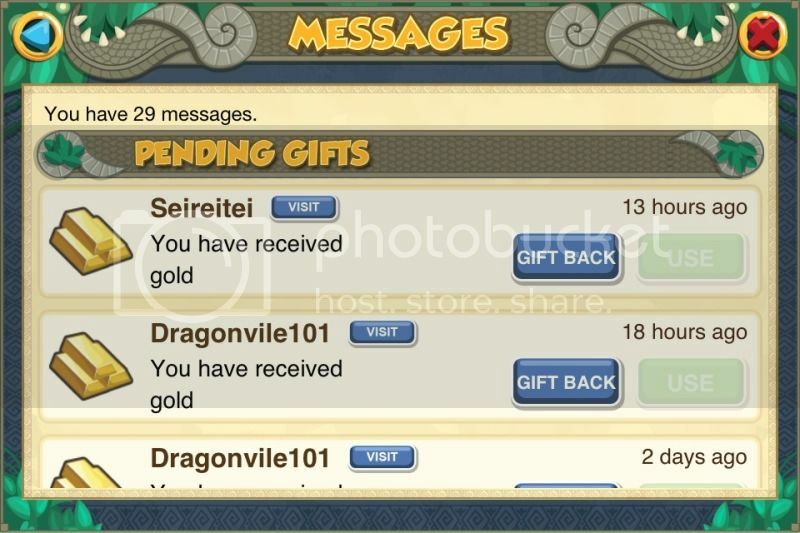 News Feed- Here you will be able to see who has sent you gold, you’ll be able to gift back gold. You may also see who has visited your dragons and has left a bonus. Social Status- Visit the islands of other Care Takers like yourself and play with their dragons, look through your friends list and send gifts or visit their isles as well. 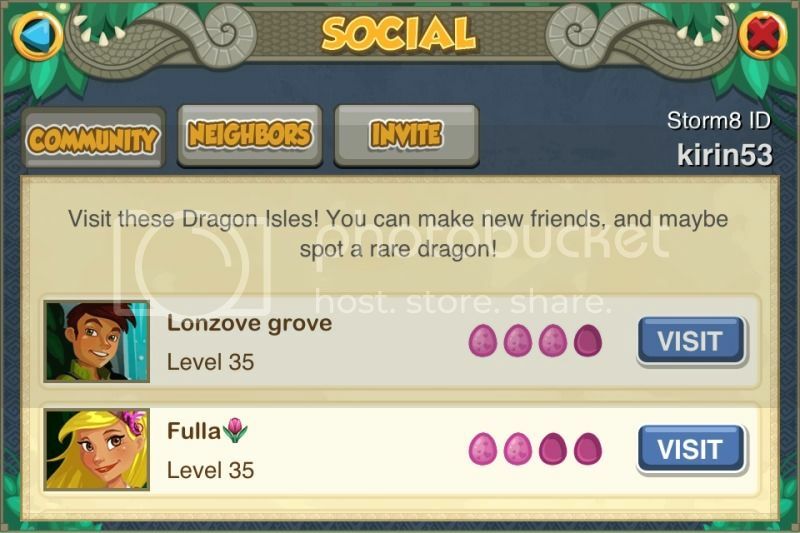 If you want your name to show up on other Care Takers Social Status, simply visit many islands and play with their dragons to increase your social rating which are portrayed as purple eggs. If you’re new and don’t have any friends just yet, move to the Invite section and invite friends by using their Storm8 IDs. 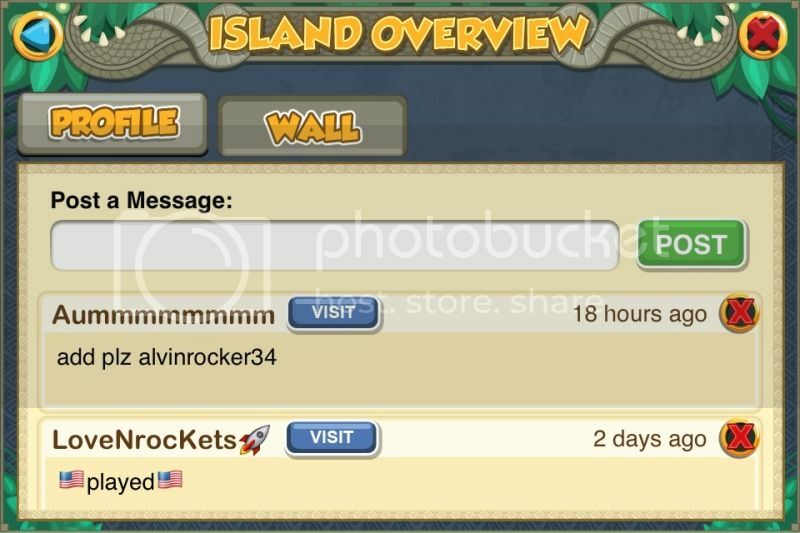 Island Overview- See what visitors and friends have written on your wall, speak with other caretakers and share information. 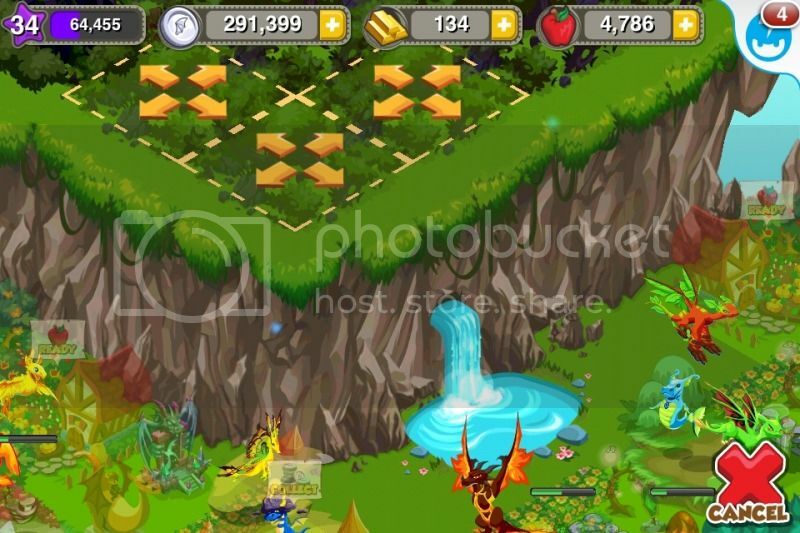 Click on your profile to see your progress in the game, Social Rating, Dragon count and more. Experience Points (XP)- Experience points is how you level up your island. There are many ways to gain XP such as completing quests or simply buying and placing items and decorations around. Sometimes, when you visit other Islands, you can get a bonus XP which are indicated as purple stars. Silver- This is the basic currency for the game, easily obtained by harvesting from your Dragon Habitats. 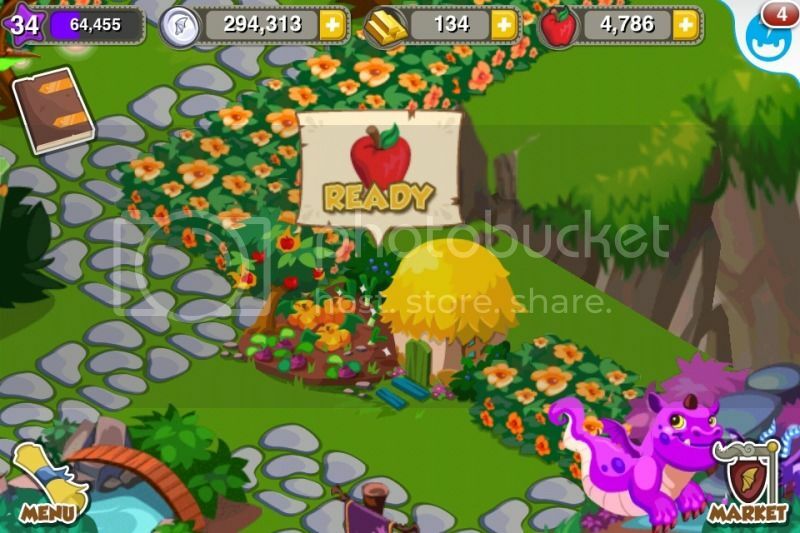 It can be used to buy items, food, and start to breed your dragons. Gold- This is the second currency for the game, though not as easy to obtain as the silver; it proves to be much more useful. You start the game with 40 gold bars that can be used to hatch eggs, speed up the process of construction, clearing of debris, or breeding. If you need more gold, simply ask your neighbors for kind gestures and return the favor. How to Purchase Additional Currency- At the top of your screen, you will see your silver, gold, and food indicator, each have a white “+” sign within a yellow square. To purchase additional silver, gold, food simply click on the “+” sign and purchase them. Gold ranges from .99 cents to $49.99, Silver ranges from 20 gold to 250 gold, and finally the food ranges from 20 gold to 250 gold depending on how much you’d want. To locate your quests, seek out the brown journal to the left of your screen. Quests are here to give you rewards for your achievements. Rewards can be silver, food, experience and even gold! Some quests might seem impossible but if you hang in there, the rewards can help you out and you’d usually end up with something you never even had to begin with, simply hang in there. 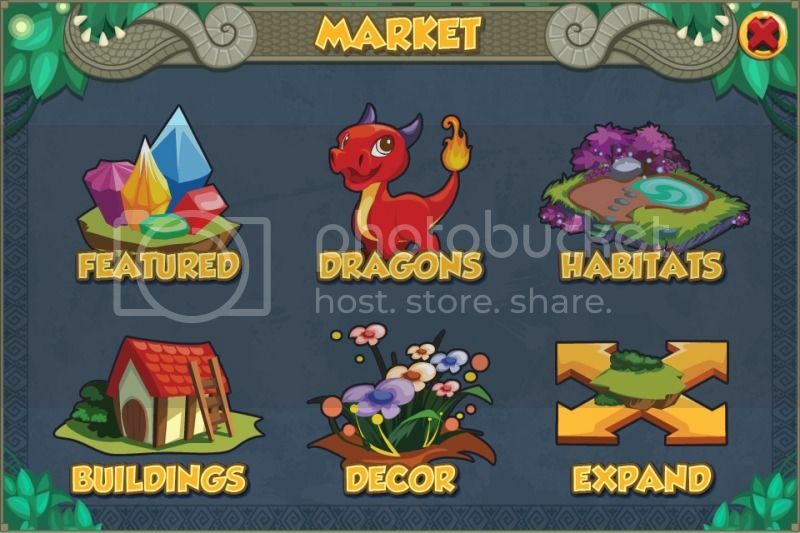 Nest- To place an egg within the nest, touch the nest and find the egg at the bottom right corner, from there you can either buy one of the dragons from the market with coins or if you’re wealthy with gold, buy a hybrid dragon to hatch. The Nest incubates your eggs and allows them to hatch within a given amount of time; each dragon egg has its own predetermined time so learning those times can help you figure out which dragon will be hatching from your egg. The color and design of the egg can also hint to which dragon will be hatching so play close attention. Breeding Den- The breeding den is a beautiful place, here your dragons prance around with joy until they create an egg with hopefully a rare dragon inside! With the dragons you get in the beginning, you can mix and match to obtain hybrid dragons that you couldn’t get originally, some dragons take a very small amount of time to breed while others can even take a day. The time it takes to breed an egg is equivalent to how much time is needed to hatch one so you can even tell which dragon you’ll have just by breeding it. To breed two dragons, choose the Breeding Den and select the big pink heart with the word breed under it; choose your two dragons and which order you want them in and wait until it’s ready. Evolution Temple- Once your dragons have hatched, you can feed them fruits and have them evolve into stronger and bigger dragons that can give you more coins every hour. Keep feeding your dragon until it has reached level ten to where it’ll evolve into its Epic Form! To evolve, simply press the giant evolve button when your dragon is ready to progress in its evolution. Purchase an Item- To purchase an item, find the market crest at the bottom right corner of your screen and touch it with your finger. Six options will show up, you can search through any and purchase it with gold or silver. Once you’ve chosen an item, you should see a green square underneath the item as it stands in your island, move it to where you’d like to place it by pressing on it and dragging your finger across your land. The purchase will only be made once you press on the green check mark, if you’re unsure of the purchase simply press on the red “X” Once you’ve purchased the item, you can rotate it so it faces a different direction or sell it by pressing on the small bag of money on the lower left hand side of the map. To sell/move the item, you must press on the item until it glows yellow and choose the “Move” insignia. Adjusting Items- Once you’ve chosen an item, you should see a green square underneath the item as it stands in your island, move it to where you’d like to place it by pressing on it and dragging your finger across your land. The purchase will only be made once you press on the green check mark, if you’re unsure of the purchase simply press on the red “X” Once you’ve purchased the item, you can rotate it so it faces a different direction or sell it by pressing on the small bag of money on the lower left hand side of the map. To sell/move the item, you must press on the item until it glows yellow and choose the “Move” insignia. Expanding- All across your undiscovered Dragon Isle, you’ll spot small brown signs with yellow lettering; to expand you must press those and transparent squares will show up telling you that you can expand to that area. In order to expand you’ll have to use up a lot of your silver and you’ll need Mystic Maps. Mystic Maps- Mystic Maps are used to explore unknown lands, you wouldn’t want to go into dark woods without a map would you? How would you find your way out?! How can you get those Mystic maps you ask? Well that’s what friends are there for, ask for their help and you’ll have maps in no time. Clearing Debris- In order to construct buildings and add decor, you must first remove the foliage out of your newly expanded land. Click on the unwanted growth and get rid of it by touching the shovel insignia on the lower right hand side of your screen. 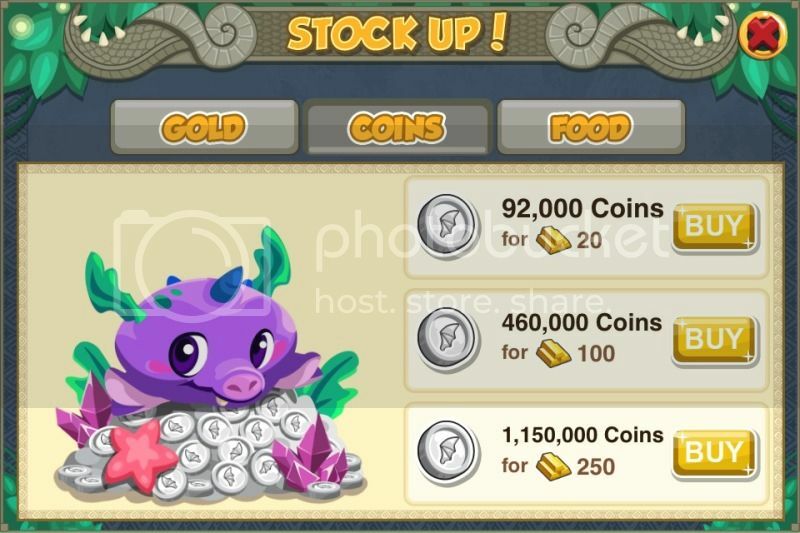 It asks for a little payment but no amount of coins should keep you from giving your dragons everything they need to stay happy! 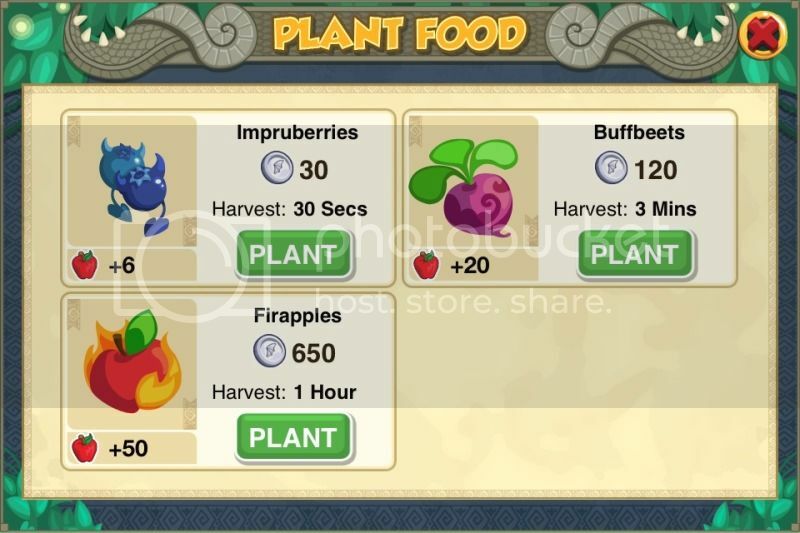 Planting- Before you plant any form of delicious dragon meals, you must make sure to have a farm. 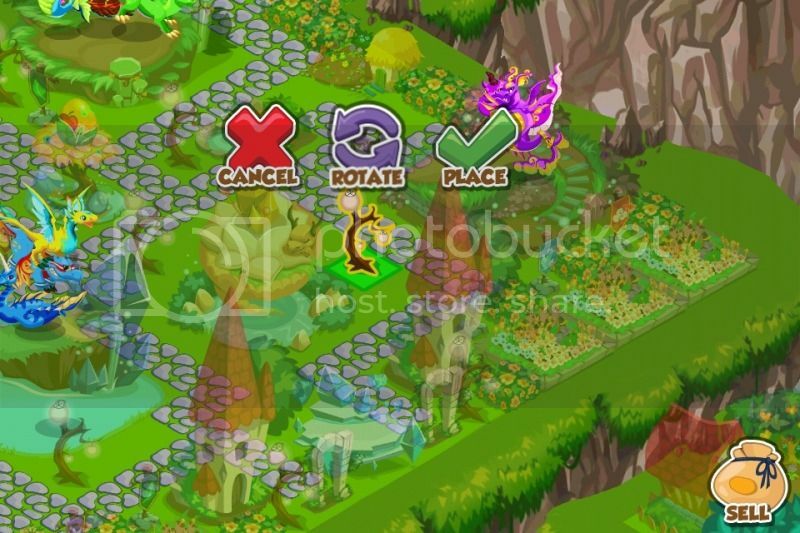 Press on your farm and touch the plant button on which ever food you want to give to your dragons depending on the amount of coins you have. Harvest- Your dragon delights are done?! That’s great, head back to your farms and harvest your food, spread them across the land and help your dragons become big and strong! I forgot my Storm8 ID, how can I find it? Easy! Go to your main menu, press the Social Insignia and your ID will appear at the top right hand side of the screen. I see people with a Diamond Dragon, how can I get one too? Diamond Dragons are the rarest of them all. A good rumor roaming around is that you must breed two dragons that have two of the four original dragon colors. All must be different. How do I make more gold? Here is a little secret? ?come closer. You know all of those Goals that ask you to play other games? Well if you do, and keep playing those games, you?ll get a little surprise once you return to your care taking duties.